Players and fans of the National Football League are making their way to Houston for Sunday’s big Super Bowl LI showdown between the New England Patriots and the Atlanta Falcons. But on Saturday, another league-related event will shine a light on a different side of the NFL and its players. Members of the National Football League Players Association (NFLPA) will host their 12th annual Smocks and Jocks art auction. Proceeds from the event will go to the Gene Upshaw Player Assistance Trust, which provides financial assistance and other transition services to former players in the NFL. 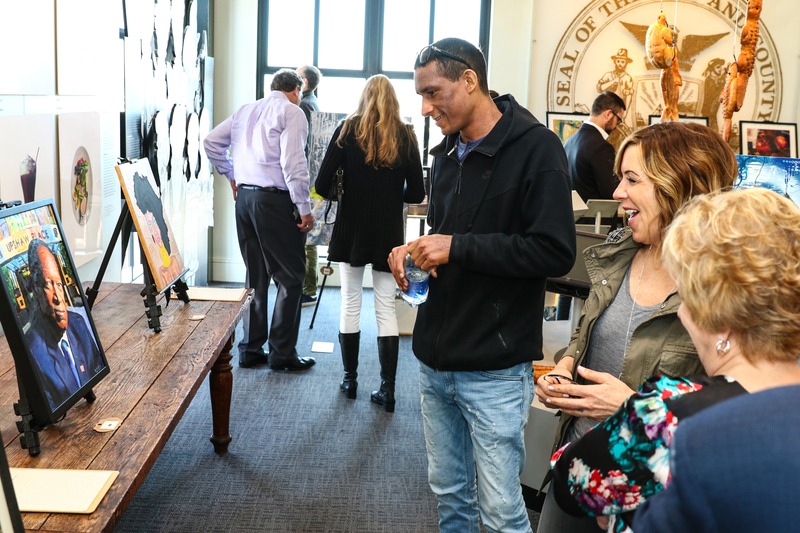 People check out artwork at the 2016 Smocks and Jocks event. 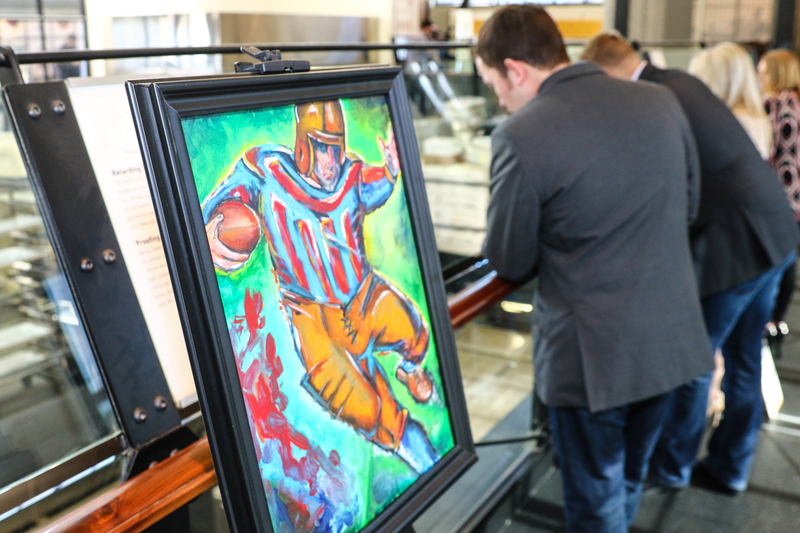 The event has auctioned paintings, sculpture, and pottery from several former players who have successfully transitioned from athletes to professional and semi-pro artists in their retirement. Collins said the auction committee hopes to raise $50,000 from the sale of the 10-15 pieces that will be on display during Saturday’s brunch at Caracol Restaurant in Houston. Many NFL players have gained acclaim for their off-the-field artistic endeavors and have been eager to participate in the program. Chris Cooley has donated pieces of his homespun pottery, and paintings have been submitted by Navy Lt. Eric Kettani, Dhani Jones, Vernon Davis, Steve Christie, Matt Blair, and Carl Eller. Garo Yepremian (Miami Dolphins) contributed for many years before his death in 2015, and his family has donated another piece for this year’s auction. The NFLPA also hosts a community event during Super Bowl weekend. This year’s event will be hosted by former Tennessee Titans quarterback Vince Young, who will sponsor a two-hour art class with students at Houston’s Madison High School, Young’s alma mater. Student artists will paint with former NFL players Ricardo McDonald (Cincinnati Bengals), Michael Holmes (San Francisco 49ers), Michael Hicks (Chicago Bears), Max Lane (New England Patriots), Darryl Gaines (Kansas City Chiefs), Chris Calloway (New York Giants), Stan Petry (Kansas City Chiefs), Perry Carter (Oakland Raiders) and Ryan Yarborough (New York Jets), among others.